As a designer of any application the user interface is one prime aspect that pays vital role in your product reaching out to maximum. That’s because it marks the first impression of work and helps the user to navigate with ease consuming his less time to get familiar to the new features. Imagine landing on a website with only text and no pictures, boring isn’t it? Quite precisely said that pictures are sometimes worth a thousand words and for a developer they add more interest and user friendliness to the invention. This has given rise to different areas in the field of content generation like writers, research papers, graphics design, corporate photography etc. One such resource which is of utmost importance of all is the photos, images and illustrations. There are lots of royalty free stock images websites where you can buy images but not every one of these stock images websites is good enough to cater the needs of content writers. One of the key features that most of the stock photo websites doesn’t have is the ease of payment and pricing plan. When a person wants to get certain photo, he/she might not be looking only for the relevant images but also a royalty stock website that is easy to interact with. But there is one such website which is exactly what a content creator would need. Fotolia is a great royalty free stock images website. 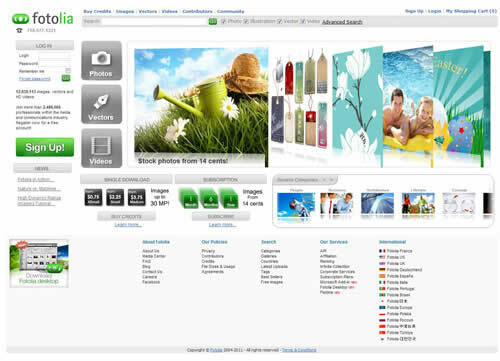 It has over 12 Million images, vectors and HD videos with 1000s new stocks added every week and over 2 Million users worldwide. With such hugeness, it stands itself as a one stop solution to all your problems. There are three vital points in Fotolia which makes it the best among others. First one is special offer for bloggers free subscription which allows bloggers to test the services by subscribing free. In this time period, you can download 5 images per day. This is the greatest offer that any website can provide. This allows you to gain trust with the Fotolia and be familiar with the services. It gives you the first hand experience with the Fotolia. The second important feature is its pricing plan and referral programs. Unlike others, it has a concept of credits where it can be used to buy images. Each credit is worth $0.75, and cost of standard image of 1600X1200 2MP (Minimal print in 5.33 in x 4 in @smashingwall.com 300 dpi) is 5 Credits, which means $3.75. In comparison to other image bank, it is the best price out there. It also has a great and are completely customizable subscription plans as your needs. Prices range from $0.41 to as little as $0.16 per image. First, choose the length of the plan – from as short as 1 month, to as long as 1 year. Then, choose the number of daily downloads – from 25 to 250. Thirdly, beside its pricing plan, it has a great option to choose your payment channel. So, with thousands of images to choose from with such great pricing plans and easy payment gateway. There is no doubt that Fotolia despite being a newbie in the market is a best service available. The extensive plans and schemes clearly mark their seriousness in the business which most of them lack. This makes Fotolia one of the uprising best place to get your stock photography. Today, we will have a new and exciting giveaway from Fotolia for one month premium subscription; the winner will have access to the main site of images for the month (under xxl subscription option, not credits), that allow to download hundreds of dollars worth of high quality images. All comments will be accepted until April 17th, 2011. Winner will be announcing on April 19th, 2011. One winner will be chosen using Random.org’s List Randomizer after the contest ends. I have been using their stock photos for more than 2 years and I like them more than other royalty free stock photo sites. Here is my comment and I hope I will win this content. This is a pretty big contest. Wouldn’t mind winning this contest, but good luck to all contestants! Nice giveaway! Fotolia is an excellent source. Great Giveaway. I love Fotolia! Indeed a nice giveaway ! I’d love to win it and have more professional images for my websites. Great giveaway, I want to win it! Great stuff. Love to win…. I already love Fotolia, they have some great images and the prices aren’t through the roof. Just starting to develop a few websites. Just got myself a reliable host. Now just need some awesome photos to help me kick start these sites. Would love to win! Good luck all! Excellent competition. I am pleased with the fact that I can participate in it. I love paid photographs, photographs of the best quality. I never used services of this service, I didn’t buy photographs on Fotolia. I hope that I will win and I will be able to try services out of this company, which base excellent photographs are in.